While smashing stages across Canada on the Canuck The Industry Tour, Tech took a little bit of time to check out the “Legends Of The Fame” trading card collection. The collector’s trading cards are exclusive to Canada and were created with the purpose of promoting homegrown talent. Fans can collect and trade the cards, much like traditional baseball cards. 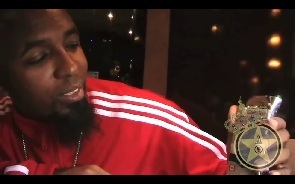 With a great contribution to international hip hop, even Tech N9ne had to co-sign the series of cards. Shouldn’t Tech N9ne have his own trading card?